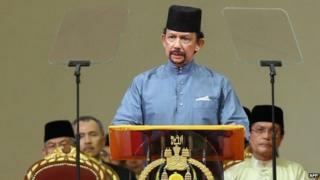 Brunei has introduced a tough Islamic penal code, known as Sharia law, sparking concern from the UN and the US. The BBC explains how the Sharia system works. Sharia law is Islam's legal system. It is derived from both the Koran, Islam's central text, and fatwas - the rulings of Islamic scholars. Sharia literally means "the clear, well-trodden path to water". Sharia law acts as a code for living that all Muslims should adhere to, including prayers, fasting and donations to the poor. It aims to help Muslims understand how they should lead every aspect of their lives according to God's wishes. Sharia can inform every aspect of daily life for a Muslim. For example, a Muslim wondering what to do if their colleagues invite them to the pub after work may turn to a Sharia scholar for advice to ensure they act within the legal framework of their religion. Other areas of daily life where Muslims may turn to Sharia for guidance include family law, finance and business. What are some of the tough punishments? Sharia law divides offences into two general categories: "hadd" offences, which are serious crimes with set penalties, and "tazir" crimes, where the punishment is left to the discretion of the judge. Hadd offences include theft, which can be punishable by amputating the offender's hand, and adultery, which can carry the penalty of death by stoning. Some Islamic organisations have argued that there are many safeguards and a high burden of proof in the application of hadd penalties. The UN has spoken out against death by stoning, saying it "constitutes torture or other cruel, inhuman or degrading treatment or punishment and is thus clearly prohibited". Not all Muslim countries adopt or enforce such punishments for hadd offences, and polling suggests attitudes of Muslims to harsh penalties for such offences vary widely. Tariq Ramadan, a prominent Muslim thinker in Europe, has called for a moratorium on corporal punishment, stoning and the death penalty in the Muslim world. There are five different schools of Sharia law. There are four Sunni doctrines: Hanbali, Maliki, Shafi'i and Hanafi, and one Shia doctrine, Shia Jaafari. The five doctrines differ in how literally they interpret the texts from which Sharia law is derived.